Opportunity to leverage my background in big data & analytics to help GSK transform how new medicines are discovered, developed and delivered to patients. 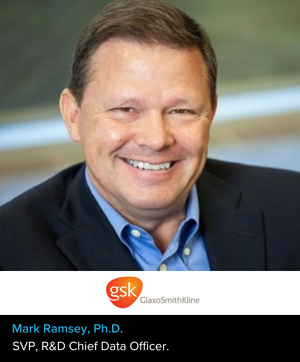 My passion for helping organizations leverage data as a strategic asset, combined with the GSK dedication to making a step change in data driven decision making across R&D. My father has been a huge influence in my life. From an early age, he taught me the value of combining vision/strategy and execution. To this day, my leadership style is one of leading by example - being able to not only speak about AI/ML, but actually develop and deploy models. Being able to actually work with the technologies, versus just talking about them, changes my ability to have discussions from the CEO to a data scientist, to a data acquisition specialist. A key effort now is executing the new R&D Strategy to access large databases derived from carefully genotyped and phenotyped patient populations, coupled with technological advances in data analytics, to direct drug discovery and development to a new generation of targets with significantly increased probability of success. Access to databases that can be used to assess the impact of genetic variation on human disease offers significant opportunities to improve drug development. The continued explosion of very granular observational data as the adoption of IoT moves into high gear. Continued advancement of AI/ML algorithms, including transfer learning to accelerate accuracy. At or above Moore's Law growth in hardware performance in support of the first two. Combined, these three dimensions are the drivers to an amazing future. Recognize that change will be constant and embrace it. A career in this area means learning new skills and abandoning others is commonplace. During my 25+ year career in data & analytics, the drivers and technologies have changed and evolved at least a dozen times - and I see no end in sight for that trend.